The Bitcoin white paper waves its hands over the implementation of the network, and even Andreas Antonopoulos’ Mastering Bitcoin skims over the implementation details of building a network-ready Bitcoin node. While its true that the workings of this network are completely tangential to the workings of Bitcoin itself, I still find it extremely interesting. Since I first started diving into the world of Bitcoin development, I’ve wanted to build a simple node that connects to the network. The Elixir programming language gives us some fantastic tools to implement a server in the peer-to-peer network. Let’s see how far they can take us! Create and maintain a connection to a single Bitcoin node. Fetch and count the list of that node’s peers. These goals help inform us about the architecture of our final solution. Since we’re only attempting to connect to a single Bitcoin node, we should be able to model our node nicely with a single GenServer. For now, we’ll assume that we’re trying to connect to a testnet Bitcoin node running on localhost:18333. This port and address can be changed to point to any node on the Bitcoin network. You might have noticed that in our initial logging statement made a call out to the BitcoinNetwork.IP.to_string/1 function, and our application configuration specified the IP address of the node we’re connecting to as a binary. The Bitcoin network supports both IPv4 and IPv6 addresses, and expects these addresses to be represented in their binary form when sent across the network, so for convenience we’ll represent all IP addresses in our application as sixteen-byte binaries. These binaries can be difficult to work with, so we’ll create a few helper functions in the BitcoinNetwork.IP module to make them easier to handle. Now we can freely shift between our base binary representation and the strings and tuple forms we’ll need to log addresses and connect to our nodes. If we were to spin up our application at this point, we’d see our log statement about how our BitcoinNetwork.Node GenServer is attempting to connect to our local Bitcoin node. The first run of our application. Unfortunately, nothing is actually happening. Let’s fix that. Our first step in communicating with a Bitcoin node is connecting to it. The Bitcoin protocol plays out over TCP, so we’ll use Erlang’s :gen_tcp to manage our TCP connection to our peer node. We’re specifying a :binary option on our connection, which means that we want any incoming packets to be delivered as binaries, rather than lists of bytes. We’re also specifying that our connection is active, which means that incoming messages will be sent to the current processes as messages which we’ll need to handle in handle_info/2 callbacks. As an aside, pattern matching on an :ok tuple works fine for now, but a more robust solution would more gracefully handle connection failures. Failing to connect to a Bitcoin node is a fairly common occurance. Now if we spin up our application, if all goes well, we’ll actually be connected to a Bitcoin node! Opening a TCP connection to a Bitcoin node doesn’t get us far. Initially, the node we connect to won’t acknowledge our presence until we send it a “version” message. This messages acts as a handshake and introduces ourselves to the new node. We’re using the little binary modifier to specify which fields should be encoded in little endian format, as specified by the Bitcoin protocol specifications. We’re also including the serialized binaries of sub-types, such as the “version network addresses” (VersionNetAddr), and the “variable length string” (VarStr). Those structures are implemented similarly to our Version struct and corresponding serialize/1 implementation. However, this isn’t quite ready to send across the network to our peer node. First, we need to wrap the serialized binary with some additional metadata about the message being sent. This is where our Protocol shines. Because we’ve defined an implementation of serialize/1 for every type of structure we’d send across the network, we can serialize it by passing it to Protocol.serialize/1 without needing to know its type. Now if we start up our application, our Node GenServer will connect to our peer Bitcoin node and send our version message. Inspecting our sent version message. If everything goes well, once our peer node receives our initial version message, it will send a message in response. In order to receive these responses from our peer node, we’ll have to implement a handle_info/2 callback on our Node GenServer that listens for :tcp messages and processes the incoming binary. Unfortunately, processing incoming TCP messages is sightly more complicated that it seems. Because TCP is a streaming protocol, no guarantees are made that a single message will be delivered per packet, or that an entire message will be delivered in a single packet. Multiple messages may arrive smooshed into a single packet, a single message may be spread across multiple packets, or any combination of the two might occur. To accommodate this, we’ll need to build up a buffer of every packet we receive from our peer node and parse full messages out of this running buffer as they’re completed. Our chunk/2 helper function recursively parses fully-formed messages from our buffer and returns those messages along with the remaining, unparsed binary. The Message.parse/1 function is essentially the opposite of the Message module’s implementation of serialize/1. Given a properly formed binary, parse/1 returns a fully populated Message struct, along with any unparsed trailing binary data. If the message’s binary is incomplete, Message.parse/1 will return nil, and our chunk/1 function will return the accumulated list of messages. Now that we’ve got a system in place to receive and parse messages sent by our peer node, we’re in a good position to handle the reply to our initial version message. 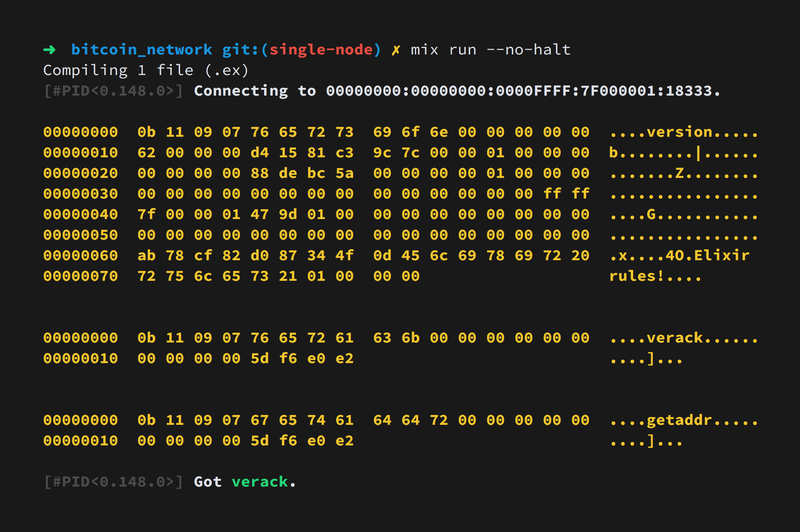 Whenever a Bitcoin node receives a version message, it’ll send a “verack” message in response. When our Node processes this response, it’ll parse the verack message into a Message struct with a command value of "verack", and asynchronously cast that Message to itself. When we receive our "verack" message, we’ll simply log that it was received. If we spin up our application, we should see our node connect to its peer node, send a version message, and receive a verack response. In the same way that we sent a version message to our peer node, our peer node will send a version message to our node. If we want to confirm our connection, we’ll have to send back a verack message as a reply. This time, rather than just logging that we received the message, we’ll two two things. First, we’ll construct and send a verack message. Next, we’ll send a followup “getaddr” message that instructs our peer node to send us all of the peers it’s connected to. Neither the verack message nor the getaddr message contains any actual content, so our call to Message.serialize/1 will simply set the command on the message and send an empty payload. Finally, once our peer node receives our request for addresses it’ll start sending back collection of “network address” blocks wrapped in an “addr” message. We first parse the count “variable integer” out of the message, and then use a binary list comprehension to transform every thirty bytes of the remaining binary into network address structs. Once we’re finished, we return our final Addr struct, fully populated with count and addr_list. If we fire up our application, both nodes will exchange version/verack handshakes, our node will ask for a list of peer addresses with a getaddr message, and our peer node will respond with up to one thousand known peers. While we’ve accomplished our second goal, we still haven’t completely satisfied our first. In order for our node to stay connected to our peer node, we need to respond to “ping” messages to prove that we’re still alive and able to receive messages. This should be familiar by now. When we receive a ping message from our peer, we log that we received the message and send an empty “pong” message as our response. Our “Bitcoin node” should now stay connected to our peer node indefinitely, responding to occasional pings and receiving occasional collections of peer addresses. This was a behemoth of a post, but I hope the ideas and techniques are simple enough to follow along with. I tried to break things down by splitting related topics into prior articles, but there’s still quite a bit of ground to cover to get a node up and running. I’ve got several follow-up articles planned for the near future, including extending our node to map the Bitcoin network by recursively connecting to every node it discovers, and more distant plans of building a fully operational Bitcoin node that verifies incoming blocks and potentially mines for new blocks. If you haven’t guessed yet, I’m incredibly excited about this project. If you’re interested in exploring Bitcoin through Elixir, let me know! This article was published on April 23, 2018 under the BitcoinElixir tags. For more articles, visit the archives. Also check out the work I do, and reach out if you’re interested in working together. Visualizing the Oplog with Splunk – In an attempt to track down the cause of a mysterious spike in CPU consumption in a Meteor application, I decided to plot a time series chart of Mongo's Oplog collection.